TA Performance, again has gone were no other Buick parts vendor has gone before... The first ever aftermarket Buick cylinder block! Designed specifically for the performance minded Turbo 6 enthusiast, this block offers the strength and options that previous blocks did not provide. The TA block incorporates superior rigidity and similar cubic inch potential to the Stage 2 iron blocks with out alienating the street and strip individual. This block incorporates all the necessary features to be used as are placement block for a daily driver all the way to a 2000 HP full race application, and everywhere in between! Notes: Blocks have been main lined to be .001" under the low side. The baffle in the oil pan will need to be modified due to the relocation of the dipstick tube hole in the block. 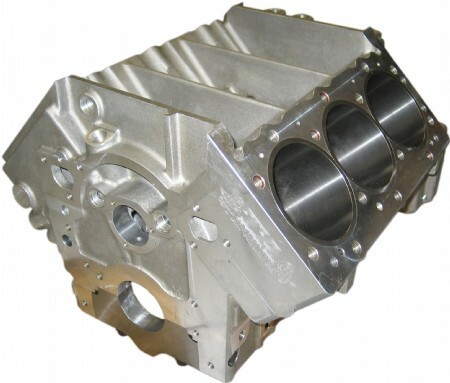 Blocks come with 3.890” Sleeves for a 3.900”- 4.00” finished bore. 3.790” are available upon request for a 3.800” finished bore size. survive an event, it survived all of them, after each race the car was able to be driven on to the trailer. During the 2006 season there was never a reason to pull the TA aluminum blocked engine from the car!